Check out our great selection of TREATS! If you can’t decide on which one to start with, try the Sampler Pack. Our dogs LOVE them all! I especially like the Tasty Rewards for training – no stain in your pocket, breaks into smaller pieces and the dogs eagerly work for that scrumptious reward. 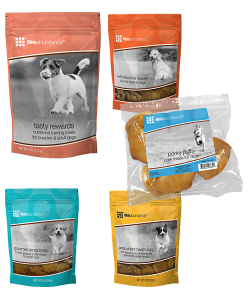 Premium chews, training treats, and baked goodies offer wholesome, healthy, and delicious canine rewards. Adding SUPPLEMENTS to your dog’s diet can play a crucial role in maintaining overall health. We know that some dogs require additional nutritional intake to help them maintain a healthy body, due to age, breed, environment, as well as other factors. Agility – Multi-action joint support formula containing Glucosamine for bone and cartilage health, MSM for musculoskeletal health, sea mussels to support joint integrity, and Hyaluronic Acid to aid cartilage strength. Skin and Coat Formula – Nutritional supplement specifically formulated to support skin and coat health with Omega-3 fatty acids from flaxseed and fish oi. Contains a total of seven B vitamins and Vitamins E, C, and zinc. Wellness – Helps maintain overall health and is the perfect complement to our premium foods. It’s sort of like a daily multi-vitamin that we take for our own health. PET CARE – Products you need to keep your dog’s skin, coat, and ears healthy, fresh, and clean. Bath Fresh Mist – Untangles matted hair, neutralizes odors, and leaves coats silky soft and shiny. Soothing Mist – Soothe skin irritations and nourish skin with a blend of aloe vera, marigold, and chamomile. No alcohol means no sting! Ear Care Formula – Safety removes dirt, eliminates odor, and painlessly dissolves waxy buildups. Revitalizing Shampoo – Natural antioxidant formulated with orange, rosemary, and sage. Cleans without stripping away natural oils with moisture-activated odor eliminators. Luxurious foamy lather. Stainless Steel Odor Remover – Not only does our Stainless Steel Odor Remover fit comfortably in the palm of your hand, it’s dishwasher safe for simple cleaning! Just rub this handy special steel alloy bar to remove stubborn smells and odors from your pet’s fur (or your hands, too). An eco-friendly alternative to soap.